With weather conditions set to worsen the planned route for Windermere was cancelled. 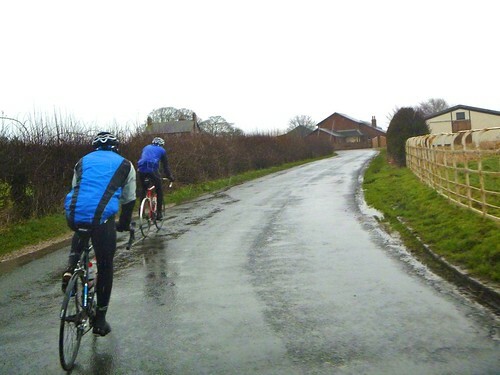 Instead a wind-cheating ride through the lanes to Longridge was proposed. Eight riders ventured out from Dalton sq into the headwind for Galgate.The group then turned left into the shelter of the lanes ,making swift progress Scorton was reached with a couple of die hards making a sprint for the sign. Down a rider ‘THE MAGNIFICENT 7’ turned left after Scorton by the Wyre. Back into the network of lanes leading from the back the pace was back on. With a couple of wrong lefts from the front and the ‘splitting off ‘ of Hass & Chris M, the group reached Longridge with another sprint .Back into mainstream traffic we carried on down the B road to Broughton traffic lights. Through the lights and onto the flatlands of the Fylde Coupled with John Agnew he commented we were averaging over 20mph, It sounded good in deterioating conditions. Fast flat sweeping roads soon got us into Great Eccleston. Crossing the A road we headed over the Cartford toll bridge, payment courtesy of John Agnew. From here it was beeline over the pancake flat roads past the potato fields to Pilling. With the wind and rain increasing it was time for those to cape up who hadn’t done so. With the earlier battering of the head+crosswinds it was time to reap our reward across the marsh with rain +wind on our backs and speeds of 30mph+ yipee! Now it was just a case of hanging on for the final lumps up Stodday. Distance 67 mls ride time 3.45 approx.